The first thing I did was to create the "Please return us after you color!" labels. Yours could say, "Thanks for coming to my party!" or "Happy Easter!" or "Get Well Soon!" To make the labels, I used Word and formatted the document to have two columns on a landscape-oriented page. Then I just typed and formatted my phrase and when it looked the way I wanted, I copied and pasted, pasted, pasted until the page was full. I made a pdf version of "Please return us after you color!" to share with you. Once I had my page ready, I printed it on sew-in computer printer fabric, available in most craft/fabric stores. I hear that you can iron fabric to freezer paper, cut it to size, and print on that, but I'm too lazy, and I already had the printer fabric. Now to turn the fabric into labels! This was easy peasy with a serger, because it did all the cutting for me. If you don't have a serger, you could cut the strips apart and zigzag the edges or even leave them unstitched for a shabby chic look. I threaded my serger with three colors of thread, to go with the crayon theme. Then I stitched along the bottom of one pair of labels, then across the bottom of the next pair/row. When all the labels had been stitched across the bottom, I had a long chain. (You'll see that chain stitching is kind of a theme of this project.) I stitched back down the other side to sew the tops of all the labels. I also flipped them right side down before stitching, so another color of thread would be shown on the right side of the label. 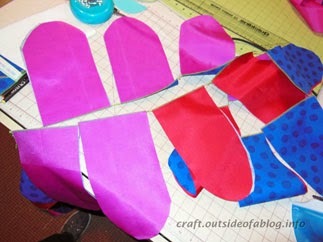 After all the labels are sewn top and bottom, just trim the threads and cut the pairs apart. The ends will get stitched during construction of the pouch. 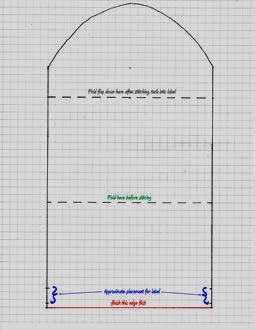 For the pattern for the pouch itself, I drew a rectangle 5 1/2 inches x 10 inches then rounded off one of the short sides. I confess that I originally intended to make the pouches tall and skinny, but then I realized that my labels wouldn't fit right! I cut the pouch in a cotton woven and in some nylon flag fabric. These were fabrics I already had on hand. The flag fabric adds some extra body and color to the pouches and makes the inside pretty and smooth. I think I cut about 20 in each fabric. You can see that I made a lot! After cutting and matching one in flag fabric to the wrong side of one in cotton, I chain-stitched them all, sewing the short straight side of each pair. After cutting them apart, I folded the bottom (short, straight side) of each pouch up 3 1/2" and pinned it, wrong sides together. To make this quick, I made a template from some scrap cardstock 3 1/2" x 5 1/2". I placed the template on the wrong side of the pouch piece and folded up the end to just cover the template. 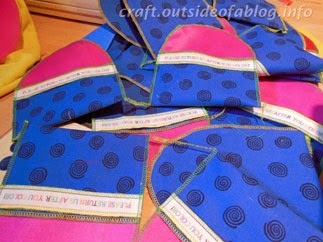 Then I pinned a label on each one, just below the stitching on the short, straight side. After pinning, it was time to chain sew again. Just stitch from one folded edge up, around the curve, and down the other side of each pouch. This makes the pouch and attaches the label all at the same time. Before I clipped the threads, I used Fray Check on each corner and let it dry. Final Step: Insert crayons and fold the flap down and tuck it under the label! How easy is that!? I love how these turned out, and I can see them used and made in lots of variations. How cute would they be in felt with jumbo ric rac instead of a printed label? Or make them with burlap and twill tape to hold a thank you note or gift card. 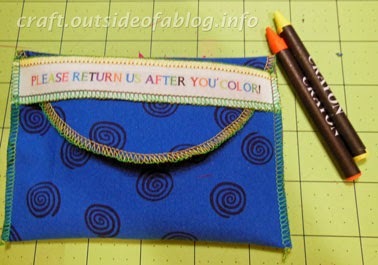 Please share your ideas for variations on Simple to Sew Crayon Pouches!